Despite achieving mediocre ratings during the show’s first season, NBC has decided to give The Sing-Off another try. 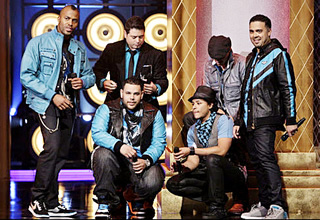 A competition for a cappella groups, The Sing-Off ran as a four episode special event in December. It began with a 2.3 rating in the 18-49 demographic and 6.89 million viewers. The ratings dropped after that but then bumped back up to a 2.3 rating and a viewership high of 7.28 million viewers for the season finale. Considering NBC’s current state, those numbers are good enough to bring the show back for another round. It surely doesn’t hurt that the series is relatively inexpensive to produce. What do you think? Are you glad to hear the show’s coming back? Is it better or worse than other reality competitions? Should it come back as a regular series or another special event? UPDATE: It’s been confirmed that the show will return for the 2010-11 season with an eight episode competition. The Sing-Off: Will It Be Back for Season Four or Cancelled? The Sing-Off: Winners Announced; Will It Be Back for Season Three? I belong to an Sweet Adelines and we sing Barbershop. I love this show. Can’t wait for it to come back. We love, no LOVE! Sing Off. We want more, the season of it should last longer! I think it is a good ideal…how many talents the America has. and its awesome when people with gifts can share with the rest of the country. I am really glad that the show is coming back. I hope to watche again. Love it. Cancel other plans to stay home to watch it. Definitely keep “Sign-Off” on, the best show in years. I’m age 67, so I’ve seen a lot of TV and I’m ;telling you that this is the best show ever. I am soooo happy the sing off is coming back on. We hadn’t heard anything about the show having a second season and were very disappointed. I told so many people about it while it was on and after the season was over. I’ll continue to tell people now that I know it’s going to be aired again. Woo hoo! @Anonymous: Season two ran in December and the show has already been renewed for season three. We loved Sing-Off in our house last year and are looking forward to a Season 2!! I hope they keep the same judges. The episode where Nicole S. sang with the Beelzabobs was fantastic! PLEASE, PLEASE PLEASE! make it a regular show! have like 12 episodes! better yet 24! well idk how they would do that but seriously this is awesome! i love acapella groups! this show is awesome! soo glad they’re having 8 episodes this season! and hoping for even more next season! The Sing-Off= AMAZING!! !